Licensee Spotlight: Kickstarter for The Pelion Report for Olympus, Inc. The Pelion Report adds to the already rich Olympus, Inc. setting by presenting five new Paragon bloodlines (Artemis, Athena, Demeter, Hephaestus, and Hera) and two new Demihuman bloodlines (Cyclospawn and Centaur). Each of these new bloodlines has its own set of powers, and in the case of the Paragon bloodlines, the book presents new corporations and subsidiaries that reflect the parent Olympian’s spheres of influence. Not to be forgotten, The Pelion Report also presents new powers for existing bloodlines as well. On the Titan side, there are new corporations that GMs can utilize to make life more interesting for their players. Along with new bloodlines and powers, the book contains a plethora of new Edges and Hindrances plus new NPCs, IMBs, Slosi, and more! In addition to new equipment and weapons, The Pelion Report has rules for working with Orichalcum. Skilled PCs can infuse Orichalcum with properties that allow them to craft better weapons, equipment, ammunition and more! 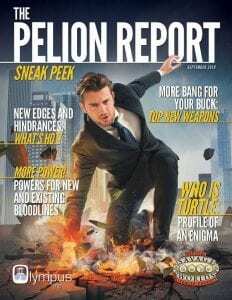 Click here to check out an eight-page sneak peek of The Pelion Report available through DriveThruRPG.com. This*Kickstarter ends*Tuesday, October 9th at 6:00pm, so be sure to pledge your support for The Pelion Report today! * You need both the original Olympus, Inc. book and the Savage Worlds core rulebook to play. For a test drive version of the Savage Worlds rules, click here.